Today is a sad day. I think he knew he was going though. His last tweet read, "A life is like a garden. Perfect moments can be had, but not preserved, except in memory. LLAP." I made a graphic in his memory. Onto the final frontier, sir. You will be missed. Another great one has been lost. One by one we watch our brothers set their feet upon the rainbow. That is a lovely way to phrase it. It was a sad, sad day. I hope he and Gene and Majel and DeForest Kelley are enjoying Romulan ale right now on a distant planet. That is what I am going to imagine from now on, when I think of them all. A beautiful tribute graphic. 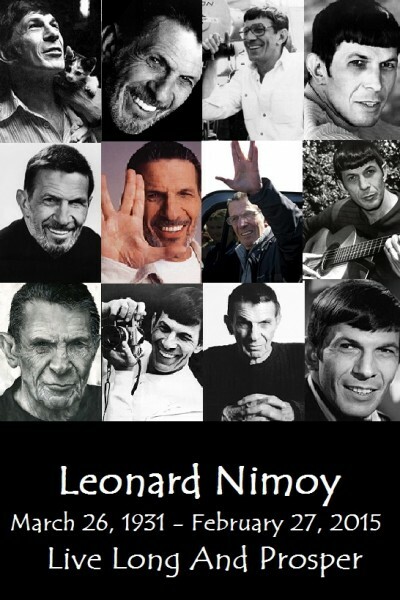 RIP Mr. Nimoy. Thank you. I hope he enjoys his next adventure. He was my FAVORITE of the ST:TOS crew, overall. I thought Sulu was cutest, I loved Uhura for being the only character like me (i.e. female) in the main cast, Scotty made me laugh the most. But overall, episode in and episode out, Spock was my favorite. I think it's because he always felt alien, and like understanding humans was hard and even with a best friend, there were misunderstandings. As socially awkward as I was growing up, I seriously identified with him. It's so hard to lose those people that shaped our lives like that, that gave us hope, that helped us see ourselves for what we are, even if they never knew it or knew their impact on our lives. It's like watching a piece of ourselves float away. I didn't get into TOS until I was early teen years, so I associated more with FML!McCoy with his grumbly-grumbleness, as for characters. But Leonard Nimoy, Idek how it happened that I saw so many interviews and whatnot with him but I just loved the way he looked at life and his thoughts on things and just...he was such an amazing guy and I think a lot of that he brought to Spock. What a beautiful graphic. He was a great man. Thank you. He truly, truly was. Unbelievable. I'm still kind of in shock. Yes, that is what I felt like. Like I could not wrap my around the truth of it. He was a great man. A true icon in the fullest sense of the word. This world will never see the likes of him again. *hugs* This graphic is beautiful and he will be missed so much. To me, he really is Star Trek. Thank you. He really was Star Trek, in his life he stood for so many things that Star Trek stood for, he brought so much to the series and to his own life that was inspiring and amazing. I hope he's enjoying the next frontier. Lovely graphic. Feeling very melancholy. Thank you. It's just a wash of sadness, to lose such a great one. Lovely graphic babe. It's so sad. The most recent show I watched him on was Fringe, and I used to get so excited each ep I knew he was guest starring in, he did such a great job. He was so amazing. It's such a sad loss. Lovely graphic babe. It's so sad. Thank you, babe. It really is, isn't it? I heard from several people who thought his role on Fringe was genius. I must have quit the show before it got to his eps, but now I think I may have to go back and watch his stuff from there. If this is how I feel about Leonard Nimoy, when I wasn't even really a Trekkie, how will I feel when like the LOTR peeps start passing away. At least most of them will outlive me, but omg, I can't even stand to think about it. That's a good way to think of it, that he's with the stars, I think he'd like that. And you'd like him in fringe, he's such a good actor.